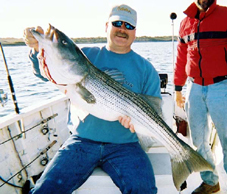 Fish the waters off Block Island with the Charter boat Adventure for exciting light tackle stripers, bluefish, flounder, and more when visiting Rhode Island. Sailing from Galilee state docks we are closer to the Block Island Fishing grounds than any other light tackle charter on the Rhode Island South shore. Rhode Island's landscape shows many signs of having been scupted by the massive Laurentide ice sheet which covered much of North America during the end of the last ice age, 10,000 years ago. This ice sheet pushed out 20 miles offshore, carving out Narragansett Bay and leaving a large deposit of material that left us the present day Block Island and Long Island. Add thousands of years of tides and evolution of fish in the ocean and you have the Block Island of today, an excellent fishing destination for both commercial and recreational anglers. The waters around the island abound with life, making it a popular destination for both bait and the game fish that prey upon them. 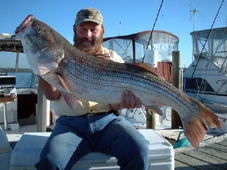 Striped bass and bluefish as well as others can be found chasing bait on a daily basis during the summer months. 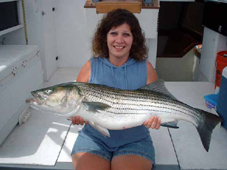 This makes it a popular place for striper charters. The shape and structure of the bottom around Block Island makes for many areas of current that fish of all kinds will use to travel and ambush their prey. From the B1 buoy at the north end to the Southwest Ledge buoy the currents and bottom structure provide areas that attract and keep predators around during the spring and summer. Many of these areas are well known to the savvy anglers that fish these waters, allowing them to go there and consistently catch fish day after day. Noting these behaviors and the currents and tides that dictate them is what separates the seasoned angler from the many novices who fish these waters. Block Island's North Rip tide is a very interesting visual phenomenon, especially on a calm day. On approaching during the strong part of the tide, one is struck by the flat smooth water on one side delineated by a sharp line from the waves on the other side, a result of the water tumbling over and down the backside of the sandbar that runs north from the point to about 2.5 miles before it drops off again into deep water (over 100 feet). On a windy or rough day, the waves can be quite large and very close together, making it difficult or impossible to fish. It is understanding this tide and the structure around the sandbar that will help you catch fish. Stripers are not stupid, they often use strong currents such as these as an ambush point, sitting behind the downcurrent side of the sandbar and ambushing baitfish that lose control in the eddies. On the west side of the island there are several areas of structure including logwood cove, Dories Cove and Gracies Cove. There are also are large number of boulders in the water along that side that can hold fish and bait. The Southwest side of Block Island is a very productive area to fish. There are many places where the bottom structure provides ambush points that bass love with strong currents to sweep bait past them as they lay in wait. You can hit these areas each in turn until you turn up fish. It is best to work from uptide to downtide, as the fish follow the tide. The Southwest Ledge itself is a catch and release only zone, as it is outside of Block Island coastal waters (3 miles). No Bass caught there can be kept. However, there are places near the ledge itself that are almost as productive and are within 3 miles of Block Island where you can keep bass. An area known as the peanut is a productive eeling spot. The East side can hold both Bass and Bluefish as well as tuna, but is not fished as much as the West side, which is easier for most boats to access and is in general far more productive. Old Harbor point, Southeast Light, and Clay Head are among some of the more popular areas. We also fish for other species out at Block Island, like flounder and sea bass. 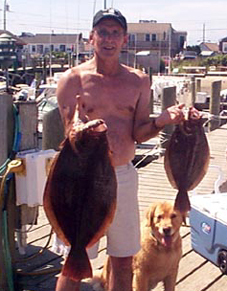 Often we may have our fill of Bass fishing and take the charter to go catch some flounder. We have had days where 20 or 30 fish come over the side in 2 or 3 hours while fishing for flounder. The flounder out there are BIG, too. Sometimes your bringing them up from deep water and it its a good battle. We will fish any or all of these areas during the fishing season depending on the length of the trip. On half day charters we may go to the rip and the northwest/northeast side of Block Island, but no farther. On full day fishing trips we will go all the way out to the Southwest Ledge if we have to to get stripers and bluefish. Usually we go to southwest point at BI, Rhode Island. Big Bass Block Island West side. 41lb at North Rip Block Island. Giant Flounder caught Block Island. Just outside of Old Harbor point. 40pdr at Block Island North Rip. Women can catch fish, too. 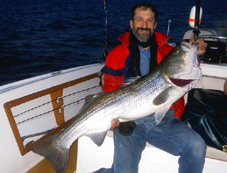 Copyright 2004-2011 Adventure Rhode Island Fishing Charters. All rights reserved.